The Cape Hatteras Lighthouse and its surrounding historic structures were moved almost 3,000 feet from their original location in 1999 because erosion caused the land it stood on to recede. It is the tallest lighthouse in the USA, and out of the five lighthouses in North Carolina, it is the one most associated with the state. 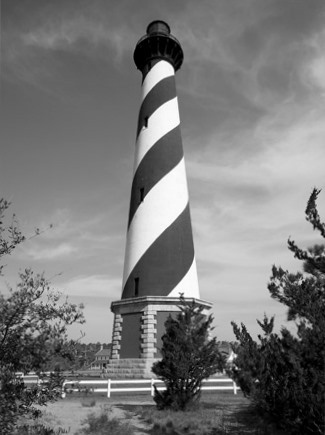 Located in the Outer Banks, the current structure was completed in 1870. Rough waters and the infamous Diamond Shoals have caused many ships to wreck in the area, in a section known as The Graveyard of the Atlantic. Reports of shadow people are the primary source of paranormal activity inside. Most mysterious occurrences happen in the water and around the lighthouse grounds. Phantom ships, and ghostly sailors and pirates have been seen in the waters of the Outer Banks. In December 1812, Theodosia Burr, daughter of Aaron Burr, was sailing with a group from South Carolina to New York on the Patriot when the schooner was blown off course by a gale, taking it close to the Outer Banks. At the time, pirates routinely sailed the area in search of treasure. It is believed that pirates captured the Patriot, killing everyone on board. For many years, there have been sightings of a female apparition, thought to be the spirit of Theodosia Burr, who roams the beach around the lighthouse.